SEOUL: The leader of the Democratic People's Republic of Korea (DPRK) Kim Jong-il has pancreatic cancer, the Republic of Korea (ROK) broadcaster YTN said on Monday in an unsourced news flash. February 16, 1942. The DPRK says Kim was born in a secret guerrilla camp at Mount Paektu, a peak considered sacred to Koreans. Kim is mostly educated in China and later attends Kim Il-sung University -- named after his father -- in Pyongyang. He joins the ruling Korean Workers' Party upon graduation and quickly rises in its ranks. By 1969, he is a member of its Politburo and deputy director of the Propaganda and Agitation Department. DPRK's official biography said that in elementary school, Kim showed his revolutionary spirit by leading marches to battlefields where Korean rebels fought against Japanese occupiers of the peninsula. Kim Il-sung names his son as his successor in 1974. Kim Jong-il, now referred to as the "Dear Leader" in state media, steadily increases his power in domestic, international and security affairs in the 1980s. Takes power in 1994 when his father dies at age of 82. 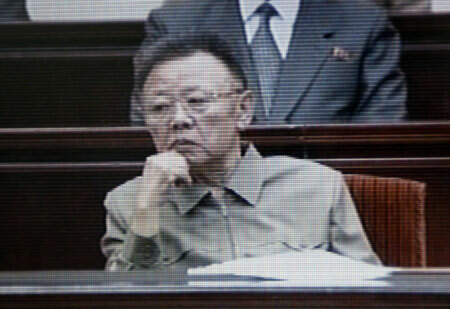 Kim Jong-il assumes title of grand secretary of the Workers' Party and chairman of the National Defence Commission, but does not take title as president. "Great Leader" Kim Il-sung is named eternal president. Kim was suspected of suffering a stroke in August 2008 that raised questions about who would succeed him. According to DPRK officials and state media, Kim boasts a photographic memory, has piloted jet fighters, composed operas, directed globally acclaimed movies and hit 11 holes-in-one in the first round of golf he ever played.